Amirisu Issue 14 - Hello Again, It's 'Gneiss' To Be Back. Hello! It has been over a year since my last blog post and a lot has changed during that time. However, I am feeling indecisive about where to start so I thought just jumping in with a pattern post would get me over that hump. 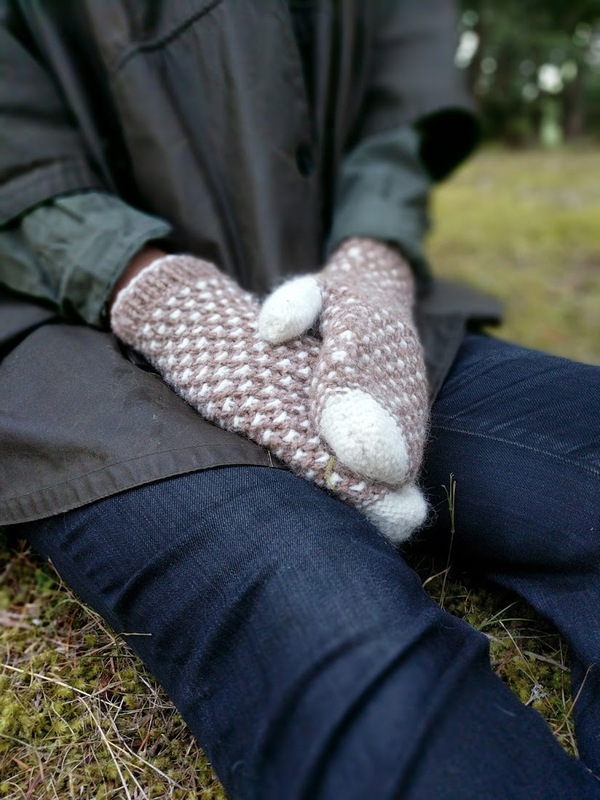 Normally, I like to blog about a pattern just when it has been released but to celebrate the re-release of Gneiss, I thought I would start here. Gneiss, was originally a part of amiriu’s collection for Issue 14, their autumn issue last year. As I eagerly await the return of the sweater I wanted to share the inspiration behind this pattern. Like most magazine submissions, I start with their mood board. I quickly see what captures my attention and begin thinking of ideas from there. Issue 14’s theme had a lot of geometric shapes and colour blocking images that I was drawn to. 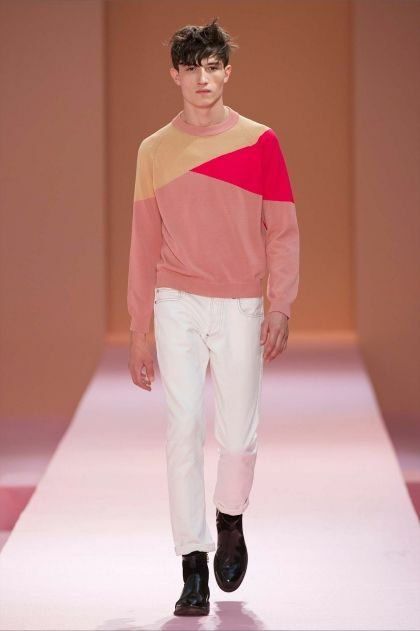 After being attracted to the colour block sweater, pictured above, it reminded me of a previous design that I already had in the works. I will admit and let you know that I had drawn up Gneiss much earlier than this proposal. The first sketch was similar, in terms of its shape and construction. However, I had intended it to be worked in two solid colours and with the right side of stocking stitch visible on the lower half. It was first submitted to a different company and was not accepted. It sat in the back of my mind for a few months until amirisu’s autumn submission call. I had reservations, of course, thinking maybe since this was not accepted the first time, it might be denied again. Maybe I was the only one who liked this design? However, I had to put those negative thoughts aside. I chose to believe that this still was a strong design and it just needed to find a home. I will not go into too much detail about the first version since with time and some new inspiration, this second version is much better. I knew I wanted to keep this sweater two colours. However, it was the photo of pink paired with the marble texture that made me rethink the types of yarn used for this project. I decided to suggest hand dyed yarn. I love working with semi-solid colours but I pushed myself outside of my own comfort zone and suggested a speckled yarn as the second colour. 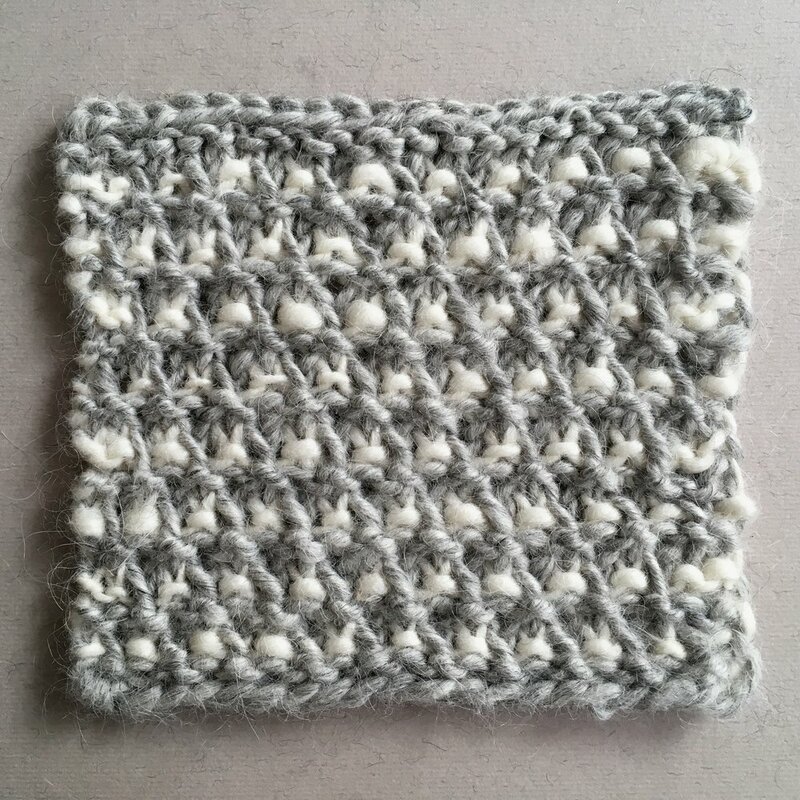 I personally prefer the impact of reverse stocking stitch when working with variegated yarns. I thought the combination of texture and colour mimics the look of marble. I then decided to changed to bottom of the sweater to reverse stocking stitch. I had not worked with speckled yarn in the past so there was none in my stash to sample with. However, I am glad amirisu was also able to invision what I was proposing. They said “yes” and suggested working with La Bien Aimée. I was happy to finally try their Merino DK for the first time. 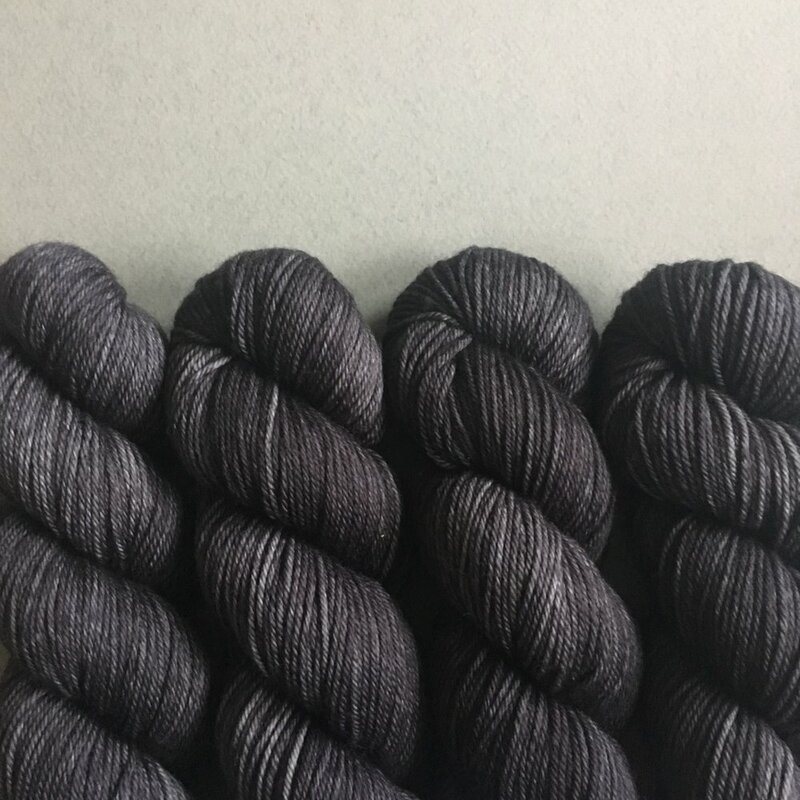 I was immediatly head over heels for the colour Ash when it arrived. It took me a little longer to warm up to Pom Pom since it was unlike anything I had used before. However, once I got into the bottom half of the sweater, I was very happy with amirisu’s decision. La Bien Aimée's Merino DK in Pom Pom. 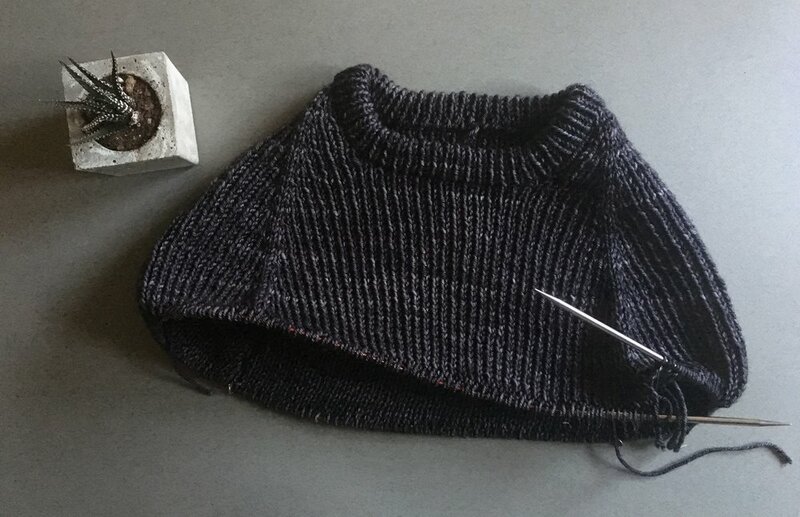 La Bien Aimée's Merino DK in Ash. Here are some in-progress photos of Gneiss. Gneiss begins as a top-down raglan. Once the arms are put on hold, the front and back and are then separated and worked flat. This allows the triangle shape on the back to be worked as intarsia. The sides must be seamed together but then the sleeves are finished off in the round. Now finally, a few shots from the photoshoot. I have loved seeing the unique colour combinations other knitters have come up with. If you would like to see some ideas, take a look at the projects page. Right now, Gneiss will be 30% off in my Ravelry shop till the end of October. Four years ago this summer, I purchased my first copy of Pom Pom Quarterly. At this time I was designing and selling my finished knits through boutiques and craft fairs but wasn’t seriously thinking about publishing my designs as patterns. However, I’m so happy that this has all changed and has now become my primary focus. I’m creating new designs every month now and have Pom Pom Quarterly to thank, along with the kind and supportive knitters who have shown interest in my work. Pom Pom published my first pattern, Take Heart, in 2013. After that I felt confident to continue to pursue inspiration for new designs. It’s been a learning curve but still an incredibly fun journey these past four years. I’m thrilled to have taken many steps of that journey alongside Pom Pom Quarterly. After a move to London, an internship, many cups of tea, my first book and a move home, I am very honoured to have worked with the Pom Pom team and to also be able to call them my friends. I jumped at the opportunity to be a part of their anniversary issue and am thrilled to be featured alongside many creative women whom I admire. "Summery" items aren’t my forte so I was thankful when I heard this issue wasn’t particularly seasonal and that they were looking for quintessential Pom Pom designs. I personally love designing and knitting hats and I thought it would be fitting since my first design with Pom Pom was a hat. I’ve been working with some simple and repeating knit and purl textures and wanted to bring that into this piece. I was paired up with Kettle Yarn Co and super excited to work with Linda Lencovic's gorgeous blends again. I previously had used her Islington DK for my Ketch Harbour shawl, in my Take Heart book. This time, I used her Beyul blend, a gorgeous combination of merino, silk and baby yak… yeah, that’s right, baby yak. It’s available in different weights, DK, 4 ply and lace. I decided on the 4 ply to create a lightweight beanie. So here’s Sparklers, I hope you will enjoy it! This project is knit with Kettle Yarn Co’s Beyul 4 ply, one skein of each Electric Amaranth and Yurt. Reverse the colourway and you’ll have enough for a matching hat, one for you and one for your BFF! Linda is now offering kits and has other fantastic colour ways listed in her shop. I highly recommend trying this blend. It’s so lovely to knit with and the pompoms it creates are just precious! This issue is packed with fifteen other designs and the usual articles, illustrations and recipe. I can’t wait to get my hands on a copy, especially with that rose gold logo! Congratulations to the Pom Pom team and everyone else involved in this issue. I can’t wait to see what's next for this group of creatives. I'm shocked that it's only been three months since my last post. It feels a lot longer with the amount of work I've been up to. Since I don't normally post about my "in progress" designs, till they are released, I feel it ends up looking like I haven't been doing too much. Since January, it has been quite the opposite. 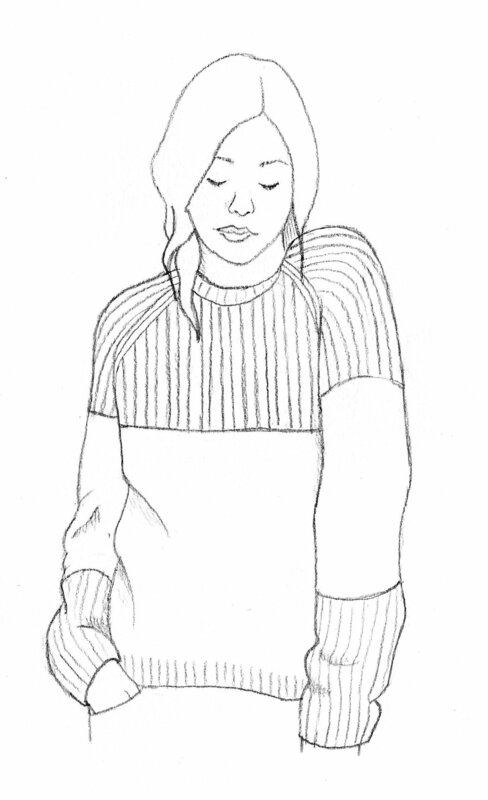 I've completed four new patterns including my first two sweaters patterns. Plus, I now have another six new designs underway at the moment. Six! So "busy" sums up my current state. Most of these new designs won't be released until the autumn but I thought I would share some photos of what I get up to in between knitting project and talk about some of the yarn I'm currently using. At the very end of March I ended up sick just as the most gorgeous mountain of Hinterland yarn arrived. The beginning of April started with some simple swatching as I recovered in bed. I'm currently working with Hinterland's Range, with the pile above showing their colours Ash, Honey and a single skein of Snow. It's beautiful, hearty yet an incredible soft blend of 50% Canadian Rambouillet and 50% of their home-grown alpaca. I have one sweater in this yarn and I honestly lived in it this winter. I hope to add more to my wardrobe soon. My second yarn delivery in April came all the way from Paris! This is La Bien Aimée's Merino DK in Ash and Pom Pom. I was really excited to finally get acquainted with their yarn and fabulous colours. It was my first time using a speckled yarn. I tend to stick to heathers or semi-solid colours. However, it was a nice change to be working with something as fun as Pom Pom. I'm just about ready to ship this new design to its final destination. I've paired these two colours together and you'll be seeing the final piece in the autumn! The past two months I've also tried to find time for other crafts that I enjoy. As much as I love knitting, it gets a little tedious when it's your job and past time. Plus, I need to be kinder to my hands and wrists and make sure I avoid repetitive strain injury. I completed these two small embriodery projects last month. The succulent and mandarins were my own designs, each one created from a photo. They're only about 10 cm in diameter and were sent off to London, UK, for friends' birthdays. Besides embroidery, I've also started to sew again. I did study textiles and fashion when I attended the Nova Scotia College of Art and Design University but haven't officially sewn a garment since graduating in 2011. Back in March, I did take a dress making workshop at Patch, a local fabric store in Halifax. This was a great way to ease myself back into sewing and get reacquainted with putting a commercial pattern together. The workshop was based on the Farrow Dress by Grainline Studio. I also did manage to make myself the Camber Dress by Merchant & Mills. I purchased a few dress patterns and fabric from Merchant & Mills years back at the Knitting & Stitching show in London and it felt really good to finally find the time to make them. The shot above is my pair of Ninni Culottes, design by Named Clothing. I think these were my first pants I ever put together besides samples in school. I wanted a pair that were easy to sew up but still a little challenging. I'm pretty pleased with how they turned out. I used a lightweight indigo fabric from Patch. Now I just need the warmer weather to wear them! Even though I'm super pleased with my new creations, my favourite discovery last month was at No. 9 Coffee Bar in Lunenburg, NS. Gluten free doughnuts! It might sound a little ridiculous but I believe this was my first gluten free doughnut ever and it was amazing. Whenever I'm down to visit The Mariner's Daughter, Lunenburg's local yarn shop, I stop by No. 9 to grab a tea for the road. That's when I discovered these delectable little treats! I'm hoping to recap more often since it gives me an opportunity to talk about other things besides knitting all the time. I'll be sharing my next pattern which was just recently released. It looks like May is off to a good start! Please welcome Fog Harbour, my second design to be released this year. 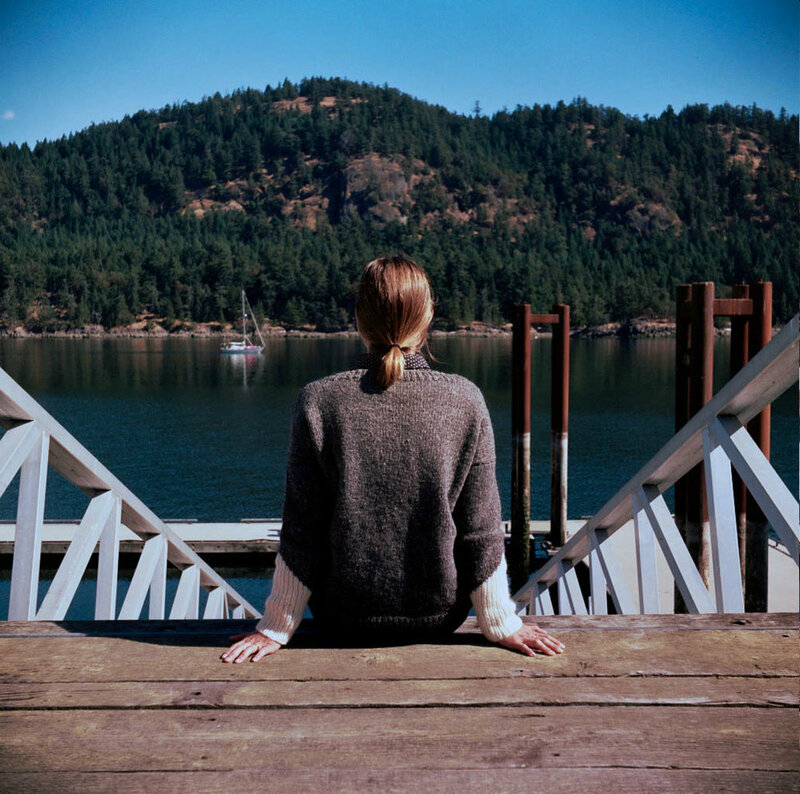 I'm also really happy to say Fog Harbour is a part of Quince & Co's latest accessory collection, Scarves, etc 6. This is my first time working with this yarn company but I am no stranger to their gorgeous blends. This fall amirisu published Phōs and in 2014, Pom Pom published Selsey, both which were knit in Quince's sport weight, Chickadee. Fog Harbour was my first chance to work with their yarn called Ibis. This a chunky weight yarn, 50% merino, 50% mohair and incredibly cozy. Ibis is sourced and milled in the United States like most of their yarns. I thought I would share the progress of this design. Often with submissions to knitting magazines or yarn companies I'll begin by looking over the criteria and theme for their issue or collection. However, this submission for Quince, worked a little differently. For Scarves, Etc. 6 the only criteria was that the design be unpublished, use their yarn and be either a scarf, cowl or shawl. There was no mood board or theme to begin sourcing ideas from so I decided to take an idea I had been thinking about for a while and bring that to life. I knew it would be a chunky Garter Stitch cowl with a hint of colour work. I started to narrow down the pattern of the colour work and found myself drawn to these strong black geometric lines featured in the textile and bridge above. The final motif I settled on for this cowl, echoes the structure of the MacDonald Bridge, which spans the harbour of my hometown of Halifax. I used vertical lines to recreate its silhouette. The construction of Fog Harbour is fairly simple. It is knitted in the round, and primarily consists of Garter Stitch. Individual pieces of yarn, in a contrasting colour, are added to create each vertical line. 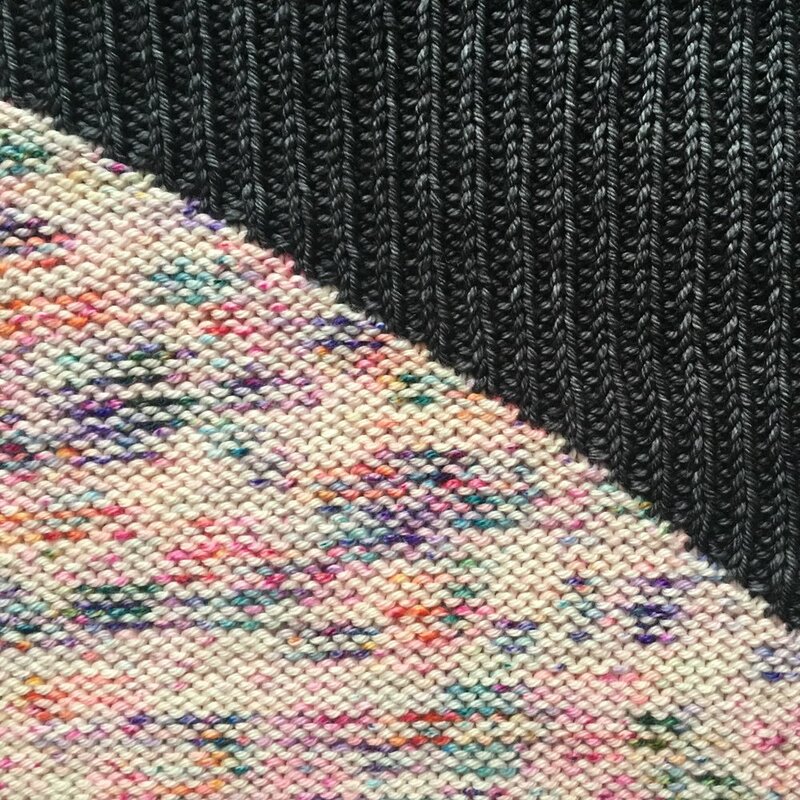 These stitches are either knitted or slipped to create a geometric pattern on top of the Garter Stitch background. There is no need to carry the contrasting colour behind the work like traditional stranded knitting. Plus another great feature is that this project works up in no time. The Ibis is very light for such a thick yarn but other alternatives could be Quince & Co's Osprey or Puffin. The colours I used in my sample were picked for the final piece, Abilene and Longhorn. Here is a photo of what the cowl looks like in progress. I admit that it does look a bit messy with the many loose ends but the technique is very simple and creates a neat and tidy inside once it's finished. Fog Harbour is now available as a single PDF download or as part of the Scarves, Etc 6 collection. You can find it through Quince & Co's website or in their Ravelry Shop. This year's collection has many varied and interesting pieces in it and I'm so happy to be included. I think the Quince & Co team did an amazing job. 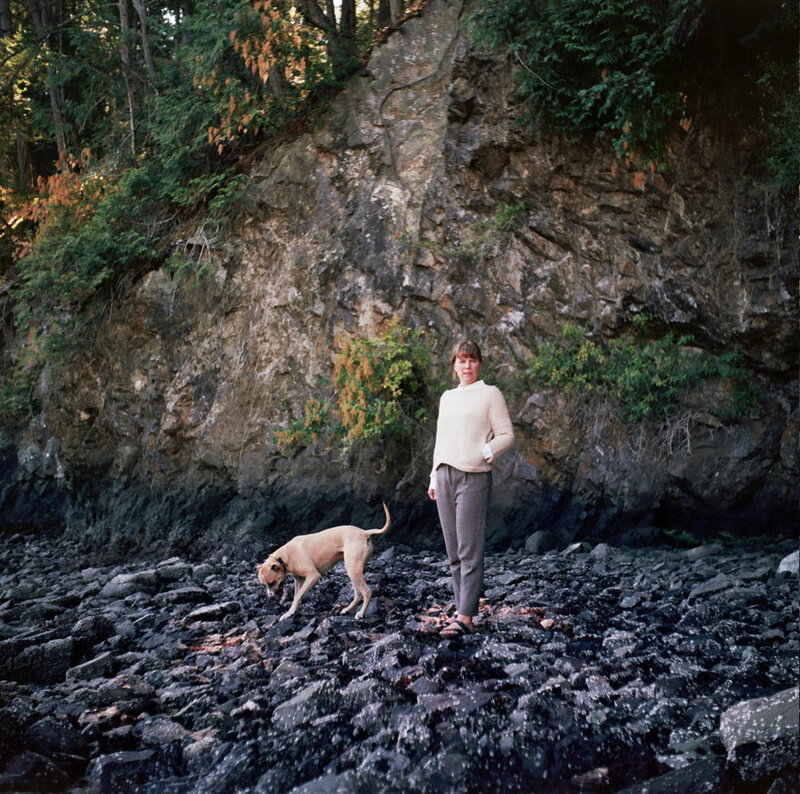 All of the gorgeous photography was done by Whitney Hayward. Visit the website to see the other pieces and more photos of Fog Harbour. As I was putting this blog post together it dawned on my that my original sample would be a perfect size for someone I know. I swear I did not knit Fergus his own mini Fog Harbour but he does look so good in it!